Jeweled belly ring with twisted dangle and gem. Body piercing jewelry. 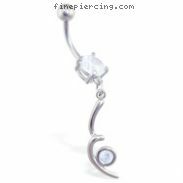 Navel ring with dangling rainbow \"Pride\"